The door opened noiselessly, and four men came in. They were in plain clothes, and one carried a large box. "Evening," said the first. "I am Chief Inspector Pointer from New Scotland Yard. These are detectives Watts, Miller and Lester. What's wrong?" Sometimes The Eames-Erskine Case, published ninety years ago, is listed as A. 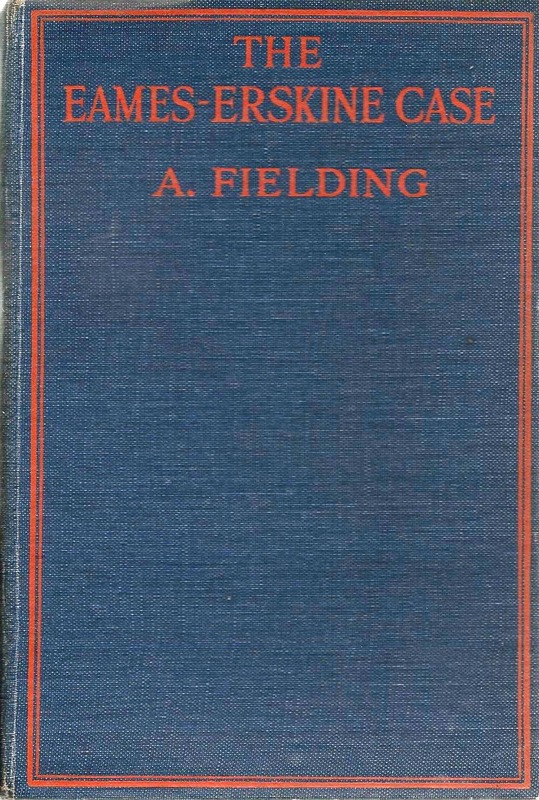 Fielding's second crime novel, but I believe it was her first. Certainly it was Fielding's first Chief Inspector Pointer mystery. I learned more about the cleverly named Pointer here than elsewhere in the Pointer canon. I suspect Fielding lost interest in fleshing him out as a character, which is too bad. In The Eames-Erskine Case, we learn that Pointer lives "in Bayswater. He liked its open squares and clearer air. He shared three rooms there with a friend, James O'Connor, now a bookbinder, but during the War a very successful member of the Secret Service." Pointer likes to talk over his cases with his friend and flatmate James, just like Freeman Wills Crofts' Inspector French does with his wife Emily (Inspector French's Greatest Case, 1924) and G. D. H. Cole's Superintendent Wilson does with his wife (The Brooklyn Murders, 1923). I discussed both the Crofts and Cole novels in the draft version of Masters of the "Humdrum" Mystery, though the chapter on Cole (and his wife Margaret) was cut by my publisher to shorten the manuscript. Along with The Eamses-Erskine Case, the Crofts and Coles novels constitute an important, and mostly ignored, strain with English Golden Age mystery: detective novels with a non-aristocratic policeman as lead sleuth. Such novels were actually common during the Golden Age, though today we usually are led to believe quite the opposite (I recall one academic writer stating that Ngaio Marsh's Roderick Alleyn, who debuted in 1934, was the first English Golden Age police detective protagonist, which is not even close). Before 1924, Crofts had published The Cask (1920), The Ponson Case (1921), The Pit-Prop Syndicate (1922) and The Groote Park Murder (1923). None of these novels actually have Inspector French, but they all have police sleuths solving crimes. These novels were tremendously popular in England and influenced the socialist academic G. D. H. Cole to try his hand at a mystery, the aforementioned Brooklyn Murders. Thus was launched another detective series, one in which Cole shared authorship credit with his wife, Margaret Cole (though I discovered that the novels were in fact authored variously by one spouse or the other). Now I see that The Eames-Erskine case belongs with these novels by Crofts and Cole. Like The Brooklyn Murders, Eames-Erskine is essentially a Crofts pastiche, and, I think, a much better one than The Brooklyn Murders. Eames-Erskine starts out with Pointer investigating a suspicious suicide at a London hotel by one Reginald Eames (Cole would use a hotel setting in his next Wilson detective novel, The Death of a Millionaire, 1925). Although Fielding doesn't depend on a Crofts specialty--detailed alibis, often involving train timetables--there is much painstaking investigation by her policemen, in the Crofts manner. The author has constructed in this novel a complex and cleverly plotted problem, with many red herrings and surprising twists and turns. There's even some subsidiary love interest, quite acceptably done, as well as a couple trips to France (Paris and the Riviera). Crofts mysteries often saw sleuths traveling to Continental Europe, especially in the 1920s. 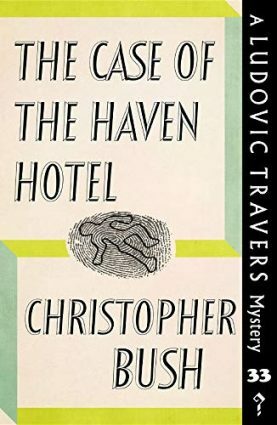 I did not forsee the solution, which seemed to me to hold together, even though once again the reader is not allowed to see all of Pointer's clues, a blemish on an otherwise excellent detective novel. 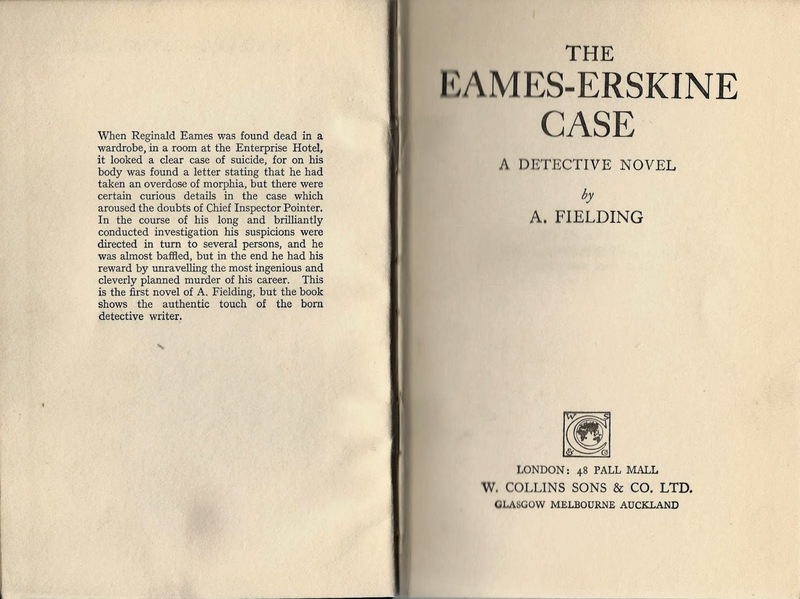 All in all, The Eames-Erskine Case is a fine example of what Fielding could do when she wrote with more care, and it's a first-rate example of a 1920s English mystery. A fascinating piece, as always, but what it's left me with is an intense desire to see the excised chapter from your book about G.D.H. and Margaret Cole. Would you consider sharing it with us here? I've always found their books to be quite difficult to obtain and I certainly haven't read as many of them as I might have liked; I'm fascinated by their espousal of Socialism at the same time as they were celebrating the exploits of an ordinary policeman. I'd very much like to have the benefit of your analysis and observations. Hi, Noah, thanks for the comment. I'm very glad you value the writing I do. It's about a 35, 000 word chapter and there's another cut chapter of about the same length on Henry Wade. So what I'm thinking of doing is publishing them as a separate, much shorter book than Masters of the Humdrum Mystery. I probably will go with a POD publisher, because it's hard to get scholarly, let alone commercial, presses to take on "obscure" authors, even though, in this case, the Coles were important people in twentieth-century English political thought and Henry Wade was one of the best and most innovative crime writers of the Golden Age. Neither the Coles nor Wade really were "Humdrums," though they have been labeled as such (I explain what it really means to be "Humdrum"--a word I try to rescue from the negative connotation--in Masters). I value your writing enough to pay for it if possible!! I think POD is a better idea, if you can't attract a scholarly press … as long as the work is not lost. I'm glad to know you've also turned your critical skills to Henry Wade, whom I've always thought deserved much more credit for sheer good writing. Wade is an author who deserves much more attention. I've always avoided the Coles though, as I usually avoid politically motivated writers. Thanks, Curt, for directing our attention to this neglcted author whose works are difficult to come by. In Hathi Trust's digital library there are several of Fielding's texts avalaible including The Case of the Two Pearl Necklaces and The Eames-Erskine Case, for the general public online only. I read several of ECR Lorac's crime novels that way on the iPad. It worked quite well. You are welcome, Juergen, and thank you for commenting, I'm always glad when some of the books I review are actually available in affordable editions! I try to do what I can to help get this stuff reprinted in some form. These books should be available in this digital age. I've read the entire review, but, mentally, I can't get past the part about the academic writer saying Roderick Alleyn was the first GAD police inspector. Having pet theories and opinions is fine, but there's such a thing as basic facts and research. I guess the paper ended with a swerve by stating that Sgt. Cuff was the first real GA detective all along. TomCat, it illustrates the problem when a critic's mental world of Golden Age English detection consists only of the Crime Queens and maybe Innes and Blake. I can see I'll have to add The Eames-Erskine case to my rapidly growing shopping list. And it's even in print!